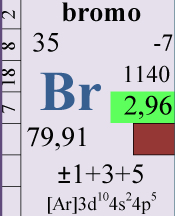 Bromine is part of the group of the halogens. The concentration in natural marine water is about 65 mg/l, rather high but ranks bromine in the class of oligoelements. Bromine is in seventh place for his concentration but is totally ignored by most aquarists. Stony corals use bromine in two different ways, first for chromoprotein synthesis and secondly for skeleton construction, as sodium bromide. Furthermore zooxantellae need small amount of bromine for the synthesis of photosynthetic enzymes. Noteworthy the case of dendronephthya sp. a soft azooxanthellate coral that uses huge amounts of bromine for the production of toxins by which catches and paralyzes zooplancton. Concerning the color enhancement, bromine role is not fully clear: some in vitro studies demonstrated that boron acts as a reducing agent on chromoproteins, during the synthesis it alters some amino-acids, allowing correct protein folding. Other theories sustain that bromine is located in the cellular nucleus, here is seems to have a role in the DNA transcription regulation. Considering its functions, bromine consumption is very low, also in highly populated tanks. However we must consider that bromine adsorption is rather complex and depends on the bromine availability in water, therefore concentration slightly below average can drastically reduce the amount corals can adsorb. As for other oligoelements, the boron integration in basic managements is often superfluous and don’t provide appreciable results, so it is sufficient to make regular water changes. Low bromine is not dangerous for corals, unless we consider extremely low values, furthermore difficult to reach. 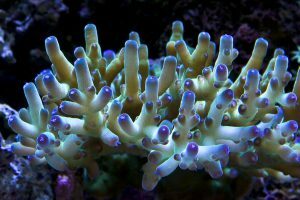 Concerning advanced managements, which purpose is to get best coral coloring, bromine supplement can produce good results on various acroporas. I personally followed a trial performed by a friend, he dosed bromine daily for 6 months without other appreciable changes in tank management. 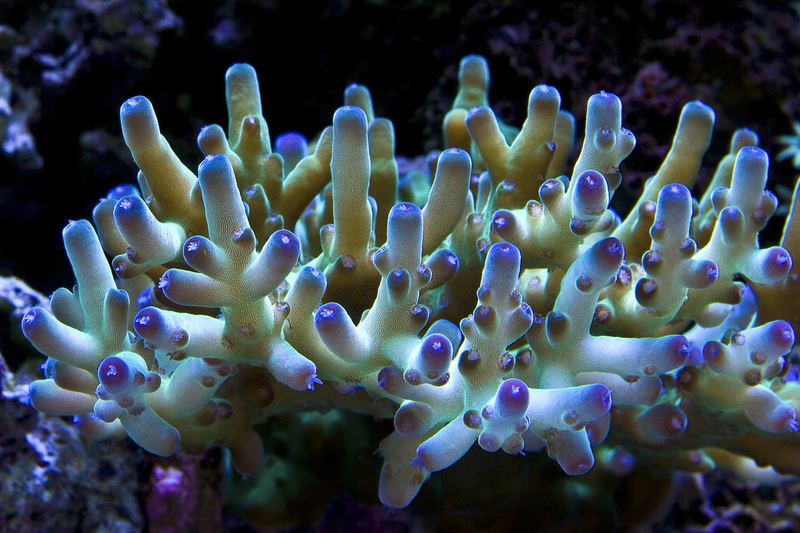 Immediately we noticed a massive rise of fluorescences and metallic shades on corals, in general a huge rise of brightness. At the same time we noticed an augmented growth rate, although new tips were rather fragile, supposedly due to strontium shortage. In conclusion I leave some tips for aquarists who want to undertake bromine integration: unfortunately there aren’t stand-alone supplements but it is easy to prepare your own home-made solution. We can find on the market both potassium bromide and sodium bromide, I suggest to use sodium bromide for its better solubility in water. Since it is not possible to make reliable measurement of bromine concentration, we should start with low doses and rise in relation to coral reactions. Indicatively we can prepare a solution with 2,75 grams of sodium bromide dissolved in 100 ml ultra-pure water. Dosing 1 drop (0.03 ml) in 100 liters daily, we dispense about 1 mg/liter of bromine, sufficient to compensate the daily consumption of a densely populated tank. A second alternative for bromine supplement is a multi-element solution which provides more elements with a unique dosage, for example KZ Kaliumjodid-fluor-brom, already quoted in iodine article. I have found this article very interesting and have started dosing bromine using your solution. How long after dosing started did you notice those results i.e. brightening of colors? Did this ‘brightening’ include a deepening of colors such as when zooanthellae increase? Where specific colors only affected i.e. blues and purples or did reds and pinks also show this ‘brightening’? How far can this dosing be ‘pushed’ that is to say will colors continue to increase if the dosage is pushed beyond the daily uptake limits? It is also interesting to note that growth appeared to increase, was this seen soon after dosing?